It’s picnic recipes season, and there are some easy BBQ side dishes that you can’t miss. A creamy, easy mashed potatoes recipe is a side dish that kids and adults enjoy. Plus, it pairs well with any of your BBQ favorites, from sweet, tangy steaks to slow cooker pulled pork recipes! It gets even easier to please a crowd when you don’t have to worry about clean-up. That’s why your friends at AllFreeSlowCookerRecipes.com recommend Swiss Diamond‘s finely crafted cookware. No matter what you’re making, you’ll be much happier using quality nonstick cookware to get it done. 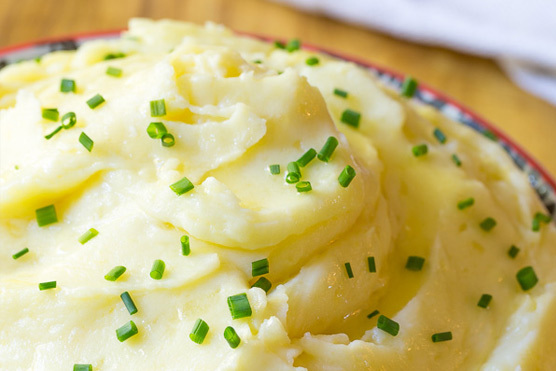 When it comes to mashed potatoes, we’ve found that they turn out perfectly creamy with just the right amount of flavor when we used this easy recipe and a Swiss Diamond Nonstick Stock Pot. If you want to upgrade your stock pot to large pot which is perfect for making soups, sauces, side dishes, and fried foods – you’re in luck! 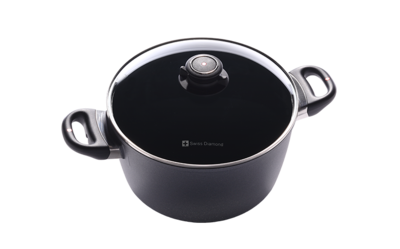 We’re giving a Swiss Diamond Nonstick Stock Pot away to one lucky reader. See contest details below. Peel the potatoes and cut into 1 inch cubes. Place the potato cubes and minced garlic in a large Swiss Diamond Stockpot, then cover with cold water. Add 1 tablespoon salt to the water and bring the water to a boil. Once boiling, lower the heat and simmer for 10-14 minutes, until you can easily cut the potatoes with a butter knife. Drain the potatoes and immediately mash until almost completely smooth. Once the potatoes are mashed, add the butter mixture to the potatoes and mix to incorporate. Mix in the cheese and salt and pepper to taste. Enjoy with your favorite BBQ recipes! Swiss Diamond Nonstick Stock Pot will let you relax and take a nap after chowing down at the BBQ. The nonstick surface means clean-up is a breeze! Plus, you can be sure your recipes will cook well in this large durable pot. When it comes to side dishes, sauces and more, we’re crazy about this Swiss Diamond favorite! See the full review. Enter to win now through July 10th! Do you find the half & half to work better than just using milk? Does it make the consistency smoother? I love mashed potatoes. A lot of the time I don’t even add anything like milk or half & half, just the potatoes with butter, garlic, cheese, etc. But it tends to be drier that way. I could see the half & half working well for the texture. We do a mean grilled jalapeno corn on the cob, and a sharp slaw is nice.